Koon Wai Bong’s latest works will be exhibited in Asia Art Center Taipei II and at Art Taipei, which is held concurrently. The opening reception and an artists talk will be held at 4 p.m. on October 14th. Abe You-ching Tsai, researcher of the exhibition division at the National Museum of History, and Koon Wai Bong are invited to discuss “On the Trends in Contemporary Ink Art”, and reconsider the disputes, recognitions, spirit and expectations in the process of ink modernization; the two speakers will also reveal their observations of the development of ink art in Hong Kong and Taiwan, which resonates with the acknowledgment of the Hong Kong artist in this solo exhibition, and examines the forms of the dynamic and significance behind the now diverse creative approaches of ink art. The exhibition is on view through November 19th, 2017. Koon Wai Bong (born in 1974, Hong Kong) received his B.A. and M.F.A. from The Chinese University of Hong Kong and his D.F.A. from the RMIT University (Royal Melbourne Institute of Technology in Australia). He is currently Assistant Professor at Hong Kong Baptist University. Koon has been active in museum exhibitions in recent years, and held solo and group exhibitions in the Museum of East Asian Art in the U.K. and in the Hong Kong Heritage Museum. He is participating in the currently held group exhibitions “Picturing Hong Kong: Ink Paintings by Contemporary Hong Kong Artists” at The Hong Kong University of Science and Technology and “The Weight of Lightness: Ink Art at M+” at the West Kowloon Cultural District. His work is collected by the West Kowloon Cultural District (M+) and Asian Art Museum in San Francisco, USA. “In the Breeze: Koon Wai Bong Solo Exhibition” at Asia Art Center is Koon Wai Bong’s first solo exhibition in Taiwan. Having sought stability in the South, both Taiwan and Hong Kong developed an identity distinct to a marginalized land in contrast with the so-called Central Plains paradigm. The same historical backgrounds provide similar incubators for art development; just as the lifeline of the New Ink Painting and the Modern Chinese Painting movements were able to take place in the relatively stable frontier lands, both were enriched by the American Abstract Expressionism as a result of their sensitive geo-political locations during the Cold-War era. When speaking solely of Hong Kong Lü Shoukun (1919-1975) and his contemporaries began to apply innovative concepts and techniques to “national painting” in the 1950s and 1960s, and used to title exhibitions “Hong Kong” more than half millennium ago. In terms of characteristics, does Hong Kong art possess any characteristics unique to its locality? How is Hong Kong art a vital extension of Chinese culture? Take Koon Wai Bong as an example – could we precisely pinpoint Koon’s artistic expression? Reworking the Classics from “In the Breeze: Koon Wai Bong Solo Exhibition” is the general paradigm for Koon Wai Bong’s art. The significant work is an in-depth scrutiny of the classical paintings, exhibiting an artist-scholar’s investigative spirits and practical abilities. The creative and theoretical aspects of art have been exceptionally mature since the ancient period. Contemporary artist Koon Wai Bong’s ten-paneled artwork is an inclusion of masterpieces in the past, while the various moods entailed by these brush and ink techniques – the outlining method and freehand (or xieyi) expression based on the drawings of pine, bamboo, mountain, water and sailboat – are a sincere expression of emotions. There may be ten different scenes, but they are all directed at the artist’s vision of the “reconciliation of man and heaven” and longing for classicism. The most monumental in scale in the solo exhibition and one of Koon Wai Bong’s largest works to date is the ninty-six-paneled Luxuriant Greenery. There are three chapters in Poems: Odes of Wei that praises honorable man at the sight of bamboo greeneries. The poem applies three layers to assert a gentleman’s image – righteousness, modesty and kindness. Koon Wai Bong always expertly grasps the towering and statuesque qualities of bamboos — the beauty of its abundant lushness, the myriad of chiaroscuro and the diversity of the bamboo branches and leaves are vividly presented. Ever since Su Shi (1036-1101), in the Northern Song, literati painting has required artists to possess moral character, literary or artistic talent, deportment and erudition. In addition, skills at poetry, painting and calligraphy have also been considered necessary for “educated men”. Furthermore, painting itself emphasizes a balance between brush, ink, qi and rhythm. 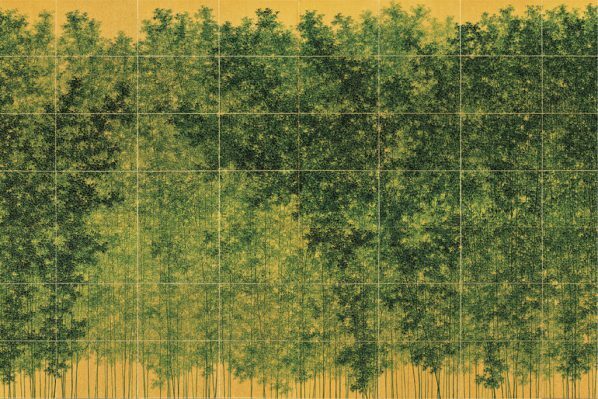 Koon has always imbued his creative work with the spirit of literati painting and his admiration for nature and culture is as vast and energy-filled as this bamboo forest, while the use of allusion elevates the work to an altogether different plane of meaning. Despite having already developed his own distinctive style, in Koon Wai Bong’s works such as In Blackness and In the Darkness, he boldly challenges new forms. Over the past few years, he has repeatedly explored the possibilities inherent in “ink” and this shift in focus has led him away from being a “model literati” to a deeper exploration of the medium itself. For example, the painting In Blackness draws the viewers’ line of sight across a mystical forest or valley into the distance and the basic structure of the piece is firstly determined by the large areas of black ink at either side. These are created from the use of splashed ink technique, while outlining and employing texture strokes to the rocks. Indeed, the “charcoal ink” showcases the artist experimenting to see how far ink can be taken creatively. As such, he also uses dense black ink to create cracks, which heighten the ink-rhythm effect and the contrast between wet-dry and light-heavy ink. In the center of the work, the precise depiction of exuberant foliage sets off a simply depicted house discernible in the distance, the faint reflection of which catches the viewer’s eye. Embracing distinctively different abstract and representational approaches, Koon perfectly combines divergent expressions of ink in a single work, creating a piece that is rich in appealing brushwork and use of ink. In recent years, Koon Wai Bong has worked to combine tradition and mechanical installation. The work Quivering is made up of 10 fragile paper fans with multiple vivid life-size bumblebees depicted on them. The exquisite painting skill is somewhat reminiscent of the elaborate insects of Qi Baishi or Yu Fei’an with changes incorporated. Although no specific timeframe is indicated, the work is imbued with a rhythm that allows viewers to imagine a cool night, listening to the chirping of insects while simultaneously enjoying the stillness and sense of motion. Several of Koon Wai Bong’s works offer a more modern interpretation of the ancient notion of “armchair traveling.” For example, his multiple framed panels create an effect that is new and appealing, alluding to scenery as though seen through a windowpane, computer or smartphone screen. In addition, this has become the artist’s most recognizable style. Rarer works including “changshan series” (literally meaning “long shirts”) such as On an Odyssey, involve Koon first commissioning a tailor to make a silk changshan and then painting a landscape onto the article of clothing imbued with a subtle relationship between the imagery and the material. When the ancients became officials they were often busy with their official duties to the point of exhaustion, as a result of which the ancient master Guo Xi wrote “The yearning for springs and woods, the companionship of mist and morning rays, are like dreams beyond the perception of the senses.” Fortunately, the “armchair traveling” methods such as painting landscapes, appreciating landscape paintings and viewing nature from afar present an alternative way of staying connected and sustaining our undying longing for nature. As part of the modern fashion for “contemporary ink art,” Koon Wai Bong seeks to strike a harmonious balance between ancient and modern, the “brush-oriented expression” and the “resistance of the center brush technique “, all while maintaining his preference for boldness and attention to detail. At the same time, he also promotes diverse forms based on the concept of ink art. Indeed, many of Koon’s works elaborate on the symbolic “spirit” of ink art which transcends both medium and its own historical burdens.